This Snowy And Windy Christmas Barren Winter Trees water globe is 6" tall and 4" long and 4" deep approximately. (100mm) Requires 3 AAA Battery. 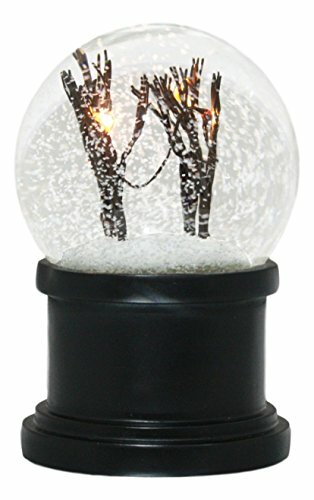 This Snowy And Windy Christmas Barren Winter Trees water globe is made of designer composite resin and glass, hand painted and polished. Color Tone may vary. Are you looking for a unique gift or a collectible for yourself? This water globe is a nice candidate for you! A string of lights has been hung on a row of barren winter trees and the now falls from the sky, with the frost and snow drops blasting around within the water globe as the internal fan moves the water. The trees are also equipped with LEDs that will illuminate to create a pretty Windy and Snowy Christmas scene. This Snowy And Windy Christmas Barren Winter Trees water globe is 6" tall and 4" long and 4" deep approximately. (100mm) Requires 3 AAA Battery. Are you looking for a unique gift or a collectible for yourself? This water globe is a nice candidate for you! A string of lights has been hung on a row of barren winter trees and the now falls from the sky, with the frost and snow drops blasting around within the water globe as the internal fan moves the water. The trees are also equipped with LEDs that will illuminate to create a pretty Windy and Snowy Christmas scene.